Duparc's Chanson Triste, Op. 2, no. 4 has been arranged for viola solo and piano by the world-famous violist Donald McInnes, who held a professorship at the University of Southern California from 1985 to 2014 and is known in virtually every corner of the artistic world for his appearances with major orchestras, recitals, chamber music participation, and numerous master classes. Duparc, a French composer of the late Romantic period, is perhaps best known for his seventeen art songs. They feature texts by poets such as Baudelaire, Gautier, Leconte de Lisle, and Goethe. Duparc wrote Chanson Triste in 1868, when he was only about twenty years old. Its glorious, soaring lyricism are representative of Duparc's hot yet controlled romanticism which characterized his music. 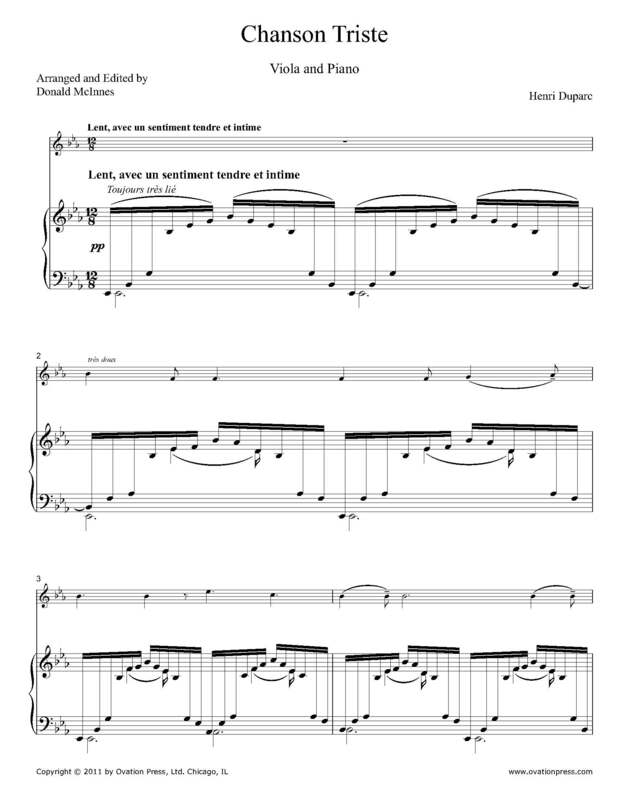 Download and print the score today to gain access to this expertly edited arrangement of Duparc's Chanson Triste for viola and piano by Donald McInnes! Click here to listen to a recording of Donald McInnes performing Duparc's Chanson Tristearranged for viola and piano. I shall drown myself in your light. That perhaps I shall be healed.